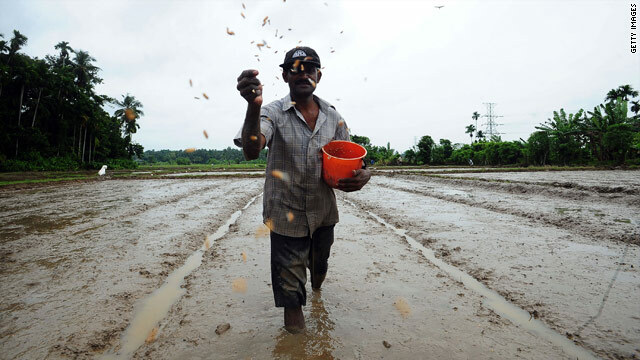 A Sri Lankan farmer scatters seeds as he sows a paddy field in a Colombo suburb in early May. Colombo, Sri Lanka (CNN) -- Though tourism is bouncing back in Sri Lanka and authorities are busy building roads and bridges in former war-torn areas, troops are still finding weapons in old battlefields and the nation remains under a state of emergency one year after a decades-long civil conflict ended. The war, which pitted government forces against the Liberation Tigers of Tamil Elam (LTTE or Tamil Tigers) -- who were seeking an independent homeland in the country's north and east, ended last May. More than 65,000 people died in the strife. Today, the once besieged northern capital of Jaffna is teeming with local tourists. Two key industries in that area -- farming and fishing -- are flourishing. Homes have changed overnight into hotels. "We can move around in peace. We do not have to fear of bomb explosions anymore," said Niroshan Weerasekera, a 36-year-old textile vendor in the capital of Colombo. But under the veneer of change, many things remain the same. The mood of fear and caution, and the residue of the bloody separatist war lingers. The greater Colombo area is a virtual military city. Checkpoints and sandbag bunkers line the streets; soldiers or police commandos armed with assault rifles are everywhere. Busloads of passengers and motorists are stopped for checks daily. A call to end the state of emergency came from the man who once wanted it most: retired General Sarath Fonseka, a parliamentarian who as the former Army commander led troops to victory over the Tamils. "There is no need for a state of emergency now," Fonseka said at a recent press conference. Yet some of the troops are now fighting a different war in Colombo -- driving bulldozers to demolish "unauthorized" homes and buildings. Police have driven out thousands of hawkers from city streets. It is part of an ambitious plan by Defense Secretary Gotabhaya Rajapaksa to make Colombo one of Asia's best cities. His elder brother, President Mahinda Rajapaksa, placed the Urban Development Authority under the Ministry of Defense -- meaning that troops are now engaged in development activity. But critics have questioned the government's claims of "normalcy" amid the ongoing large security presence. "The benefits of 'normalcy' will reach people only when they do not face hassles in their day-to-day life. Hence, intelligence services should be improved and security kept at a minimum," said opposition leader Ranil Wickremasinghe. Military spokesman Major General Prasad Samarasinghe said authorities were gradually scaling down security measures but it was "essential to maintain a troop presence to cope with any eventuality." For Pres. Rajapaksa, his position is much improved after last year's rebel defeat. He trounced Fonseka, his partner in military victory, at the presidential elections in January and his ruling United People's Freedom Alliance won a landslide victory in the parliamentary elections in April. The party gained 144 seats in the 225-member assembly -- six shy of a two-thirds majority. With the main opposition United National Party (UNP) in disarray over a leadership crisis, analysts believe Rajapaksa is set to win more than the required two-thirds vote for any constitutional changes. Proposed amendments include the deletion of a provision that limits a president to two terms. If this is removed, Rajapaksa could seek office again. "Sustaining his current domestic popularity as the months roll by will be a task itself," said Sinha Ratnatunga, editor of the Sunday Times, Sri Lanka's widely read English weekly. With 80 key institutions under his direct watch, Ratnatunga said, it could go either way for Rajapaksa. "The war may be over but the government will now have to attend to the hardships of the people. Living costs are mounting as essential commodities go up in price. The pay rise (for state sector workers or employees) promised during polls' campaign has not been honored so far," said Mangala Samaraweera, a former foreign minister under Rajapaksa who is now an opposition member of parliament. "The war can no longer be used as an excuse to force people into hardship," he said. Sri Lanka's economy grew at 3.5 percent in 2009 amid "challenging domestic and external conditions," according to the Sri Lanka Central Bank. Inflation, the bank said, as measured by the year-on-year change in the Colombo Consumers Price Index (CCPI), declined to 4.8 percent by the end of 2009 after surging to 28.2 percent in June 2008, according to the most recent statistics available. "Tourist arrivals have increased. However, these are based on last year's contracts. We have to see how the feeding markets will perform this year," said Kumar Mallimaratchchi, former president of the Tourist Hoteliers Association. The International Monetary Fund bolstered the South Asian nation's economy by pledging US$2.6 billion in six different tranches. The first two came last year. However, a third has not been delivered after complaints that the government had not met some of its own budgetary targets. A visiting IMF delegation is holding talks this week in Colombo. "Revised targets are sure to win them more money," said Feizal Samath, an economic analyst. Yet, problems with the West remain. UN Secretary General Ban Ki-moon plans to appoint a panel of experts to advise him on accountability issues related to the military defeat of the rebels, including alleged "war crimes" by troops and rebels -- allegations both the government and the rebels deny. Rajapaksa has declared he will appoint a commission on lessons learned and reconciliation. U.S. Ambassador to the United Nations Susan Rice welcomed the move. The commission "could play a valuable role in advancing accountability when they were appropriately constituted and enjoyed broad public support," she said. In what is seen as a conciliatory move to the West, Rajapaksa ordered the release of Sri Lankan Tamil journalist J.S. Tissanayagam, who edited the North-Eastern monthly. He was handed a 20-year prison term last year under anti-terrorism laws after he was accused of conspiring to cause ethnic violence through his articles. The U.S. and the European Union criticized Tissainayagam's sentence. Because of concerns about Sri Lanka's rights record, the European Union announced that it was suspending preferential tariffs for a variety of Sri Lankan export items, mainly apparel -- one of the country's top money-makers. Sri Lanka called the move unfair. With the Sri Lankan government's new initiatives in hand, an official delegation is now in Brussels for fresh talks. "His (Rajapaksa) balancing act with India and China so far has paid rich dividends at home, but his view of the West as having 'evil intentions' needs to be re-assessed," Ratnatunga said. For some, this week's anniversary is bittersweet. Many of the rebels are dead, while thousands of their fellow fighters are in custody awaiting trial. Yet others have fled the country. Tamil National Alliance leader Rajavarothayam Sampanthan called upon Tamils to "mourn and hold silent prayers" for what he called "the day of catastrophe" -- the day the war ended. A joint statement from the alliance's 14 parliamentarians read: "During the height of the war thousands of Tamil people were killed and thousands of others suffered heavy losses and were forced to flee their homes."